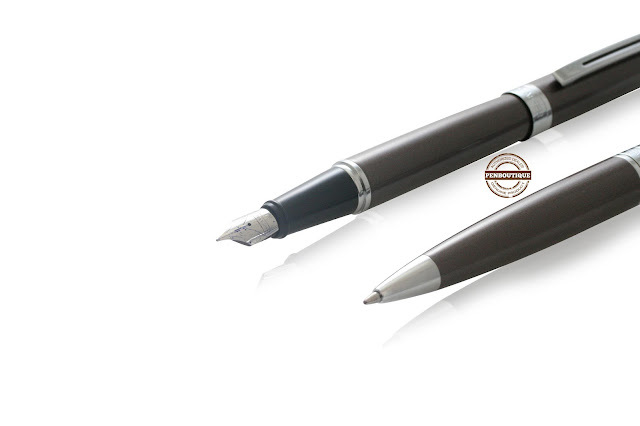 Summary: This is a great set for people who enjoy heavy pens with classic, minimalist design. 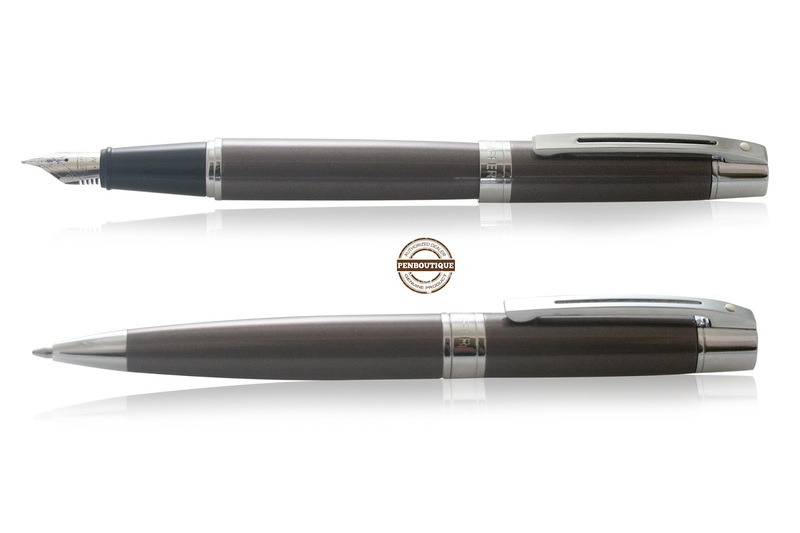 The color of the pens are unique-- a lacquered grey that borders on brown. With a metal body and chrome trim these pens feel hefty in the hand. Because of the metal lacquered body, these pens are perfect for engraving your name or company name into the cap. The spring loaded clip is perfect for wearing in the shirt or the pants pocket. 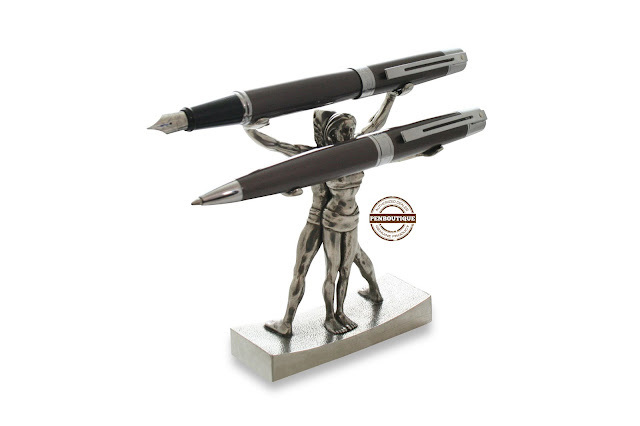 The fountain pen has a wonderfully smooth stainless steel medium nib that puts down a wet line. First Impressions: When I first got my hands on the Sheaffer 300 in Grey the first thing that caught my eye was the unusual, earthy, neutral color. I’ve never seen another pen with this color-- it’s incredibly subtle grey with brown and green undertones. Others think that the color leans more towards the purple side. The chrome trim plays well with the grey body, making the pen eye catching. Writing with this pen is a wonderful experience-- it is a Medium nib that writes consistently and with a nice wet line. It stands out as one of the nicest steel nibs I’ve used. Performance: Right from the get go I inked this pen up with Sheaffer Skrip Blue ink and it put down a gorgeous vivid blue line on the page. I have used my fair share of steel fountain pen nibs, but this one is consistent, sturdy, and puts down the perfect sized medium line. Pairing the quality nib with the heavy body of the pen creates a writing experience that is slow and confident. My hands are particularly slow, so I found these pens to be slightly large but still comfortable and well balanced. I’ve mostly used this pen for writing notes but I did write one letter with it and particularly enjoyed the wet writing. Feedback from my coworkers and customers with larger hands say the weight and size are perfect for long writing sessions. At work I’m on my feet a lot and prefer to clip my pens to my shirt or inside my pants pocket. Some of my beloved pens have inferior, stiff clips that require two hands to slip over the fabric. Not so with the clip on the 300. The spring loaded, wide clip on the 300 really helps for easy clipping and removal. If you’ve never used a spring loaded clip and you keep your pens in your shirt pocket, you’re missing out. The fountain pen comes with a Sheaffer cartridge and converter. Needless to say, the pen writes wonderfully with Sheaffer inks but you can always switch to another brand if you want to experiment with colors (imagine the J. Herbin Stormy Grey coming out of this Grey pen!). The ballpoint takes a Sheaffer ballpoint refill which is available in blue and black. The ink flow is dark and consistent-- great for office work and writing notes. The set comes with a black ballpoint refill ready to go in the pen.